Only the brave or the daft tackle York on a weekend, especially with the ominous double header of train strikes and snow chucked into the mix. Handsome old place, of course, but take a wrong turn down a wrong alley and there’s a strong chance you’ll find yourself gate-crashing a ghost walk or bumping into a Viking on his break from Jorvik. Survive the gauntlet, though, and you’ll find Le Cochon Aveugle down on Walmgate where, necking a warming “burnt turnip broth” we quickly reason that a kitchen capable of elevating a dowdy lump of root veg into a liquid that tastes – brilliantly and bizarrely – like the charred toppings of a pepperoni pizza is obviously worth any amount of ballache in getting to. I’ll cut to it. Le Cochon Aveugle is mint. 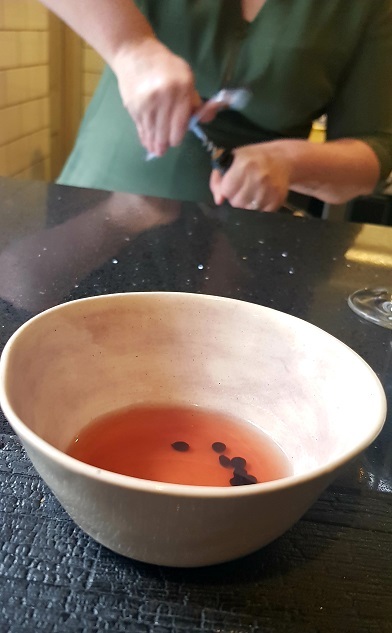 We’re here for the 40 quid blind tasting/get-what-you’re-given lunch menu – available only on Saturdays hence today’s mission – and we’re scoffing it at the counter overlooking Josh Overington’s tight, well-oiled kitchen. It’s a merry couple of hours. After that cup of turnip broth/liquid pizza we get into a pot of “Yorkshire salad”, last scoffed in my youth at the big table of countryside-dwelling grandparents as a side dish to Sunday lunch. 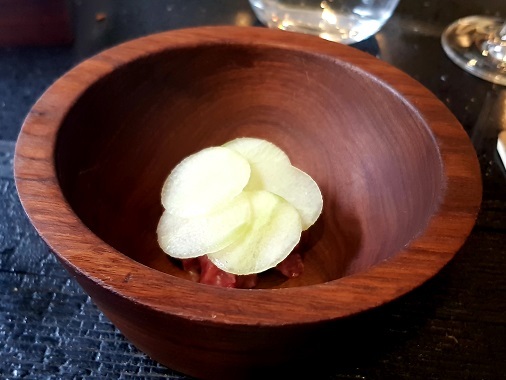 Although it was some years ago I’m confident the version knocked up by my forebears didn’t include gamey 60 day aged raw beef and a bone marrow glaze like it does here. Perhaps I’d have visited more if it had. Doused in an enlivening combination of cucumber and vinegar – additions I do recall – it’s a reminder not only of Nanna and her thirteen yapping dogs but of how all humdrum Sunday dinners would benefit from a kick up the arse with this kind of punchy accoutrement. Try it. 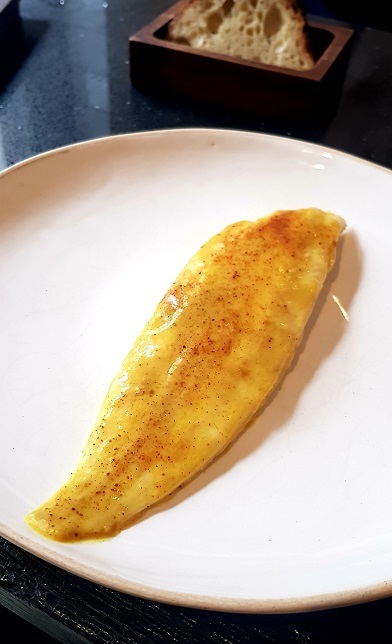 A slab of buttery slipsole, aglow with turmeric and lightly spiced (at least I think that’s the aroma inducing lunchtime thoughts of a suppertime curry) embodies the less-is-more approach to good scran. No fuss, no frippery, just a damn good piece of fish cooked bang-on and presented without needless embellishment. Well, there’s a scattering of dehydrated scallop roe providing some supercharged seasoning, but we all do that in Bradford. Talking of buttery slipsole, as I am wont to do, there’s a happy symbiosis between butter and kitchen at Le Cochon Aveugle. They employ it liberally here and it both gladdens and solidifies my heart. 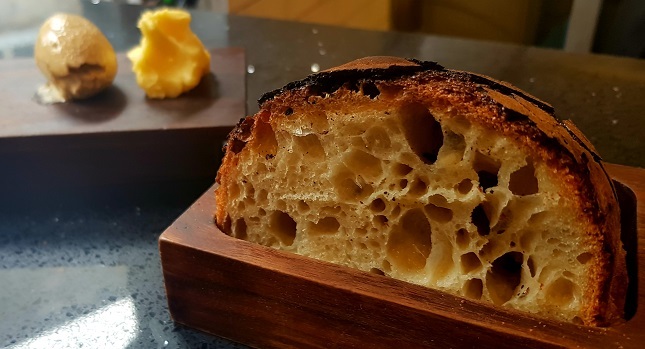 There are cultured and noisette mounds that we slather over excellent stretchy sourdough; while, from our perched vantage point, we watch nuggets of resting meat being basted in the stuff by the pan-load. Oh happy day. One of those nuggets rocks up on the plate in a refined but booming take on Hare Royale; a rich and brilliant thing. 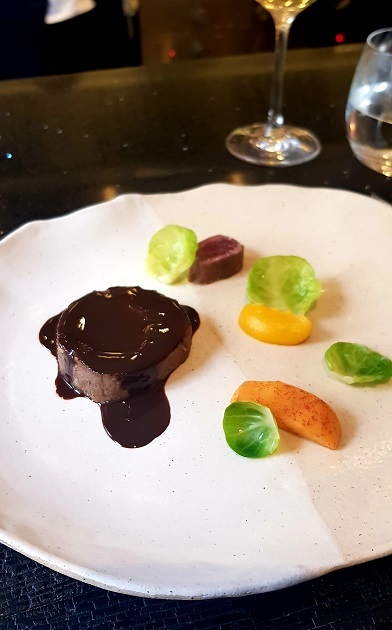 On the plate: tender, butter-drenched loin; long-braised leg engulfing a wodge of foie gras (obvs) and, just to make sure your heart really knows it’s had a workout, a silky blood sauce which, to its creator I say this: the hours of toil were worth it. 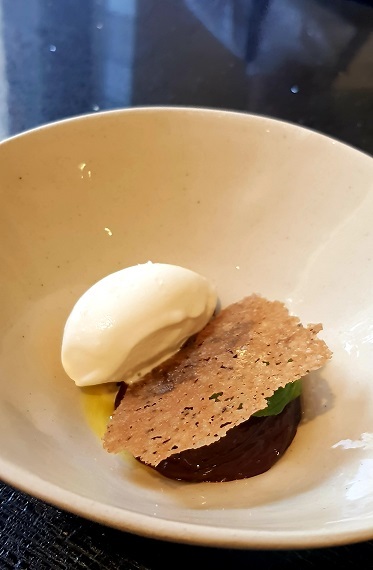 A bowl of warm chocolate mousse with sea-salt ice-cream and a snappy Szechwan pepper tuile sees a crowd-pleasing ensemble given a thoughtful spin; those savoury hits making it an addictive number. Here’s a proper pudding, luxuriant and treaty, spruced up so that idiots like me can do that ‘thoughtful nod’ after each shovelful. I tend to swerve the ubiquitous wine flight these days following a thirsty experience elsewhere that’s best described as ‘a dry old do’. Given front-of-house gaffer Victoria’s enthusiasm and knowledge of what’s what behind each glass we sup here, however, I could be tempted to have another go when we next visit. Which will be soon, hopefully, because Le Cochon Aveugle’s a belter. Like the place itself, dishes are neat and precise but satisfyingly robust. Even after fighting our way back to the station and enduring the delayed journey home we have no desire for that curry later. See also: Cave du Cochon from the same folk; a top spot in which to get amongst good wine and, as of recently, good-looking A La Carte fodder. Conveniently located close to the Le Cochon Aveugle. And another thing: the Wensleydale Heifer up in the Yorkshire Dales does a ‘wet Yorkshire salad’ with its Sunday offerings. Just remembered.